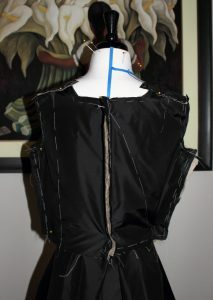 This week I finished pad stitching the silk taffeta kirtle interlinings and basted the outer fabric in place. I popped it on the dress form with pins holding it together to see how it looked. 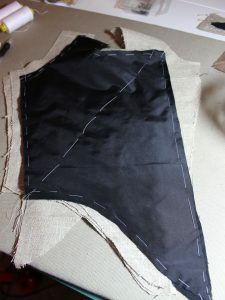 The 3 layers of canvas at the front (which may be overkill) plus the pad stitching gives it lots of shape and structure. So much the bodice stands away from the dress form on its own with very few wrinkles. I need to trim down the edges of the canvas before I put the lining in. 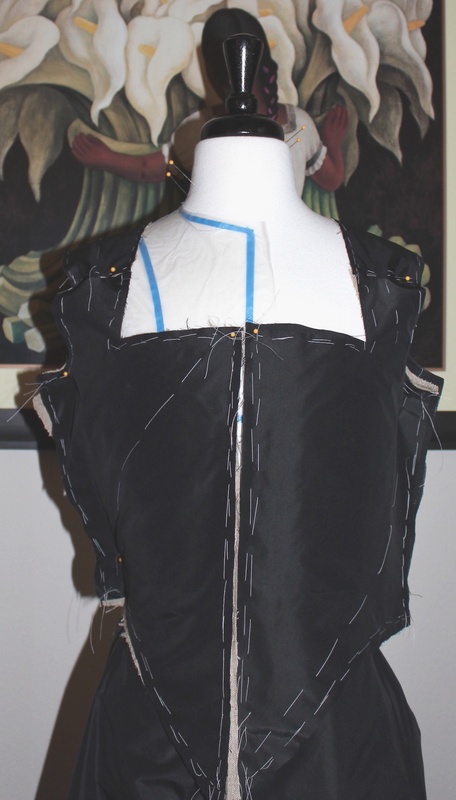 I also need to decide if the kirtle will be back or side opening. Side lacing kirtles are easier for me to get into and offer more flexibility in sizing. 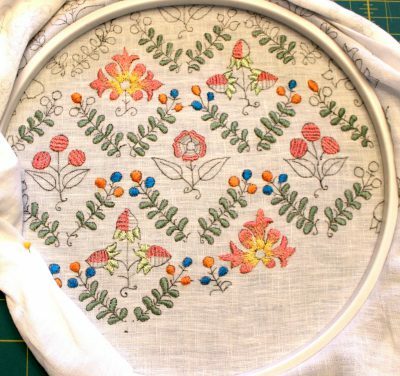 The trade off is I’ll have to sew twice as many eyelets and my sleeves will need to lace on. I may also narrow my shoulder straps along the neckline edge. 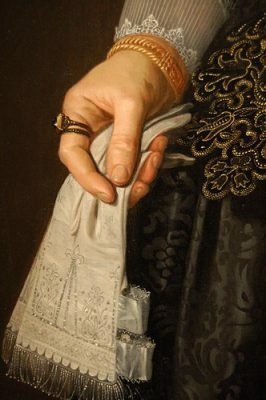 There is a 1/2 inch seam allowance to keep in mind, but after looking at some extant garments the strap is still a little wide. The silk taffeta kirtle skirt and lining are sewn together, save for the side seams. It is currently hanging on the dress form to let the bias drop. I may baste a lightweight chain to the hem to hurry the process along. I also experimented making my own cording out of silk buttonhole thread. 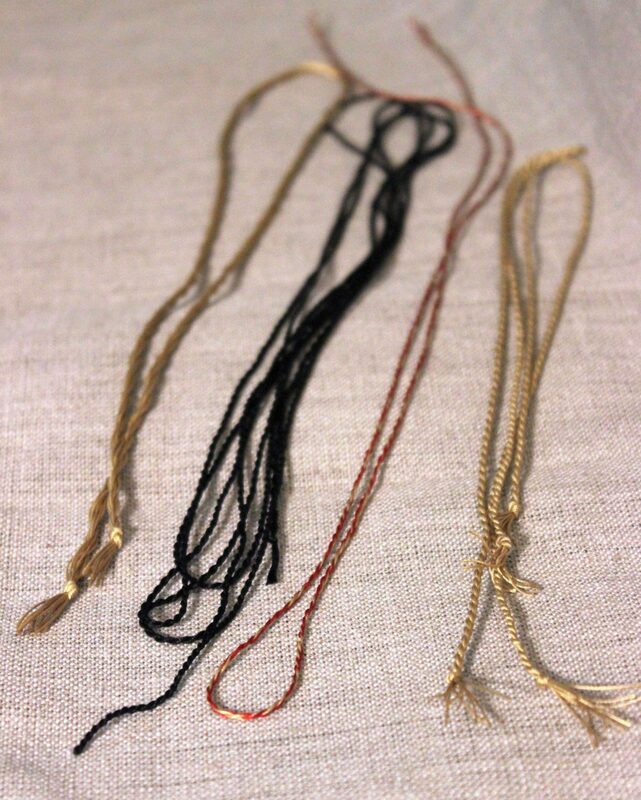 The gold cord on the far left is from twisting it by hand with the help of a chopstick. I twisted the other cords by machine which was much faster and even. I found making very long cords is an issue. The black cord is the longest I managed by myself, another person to help would keep the tension even and the threads from getting tangled.